Any good cook will tell you that the secret to great-tasting dishes is in the spices and seasonings used. 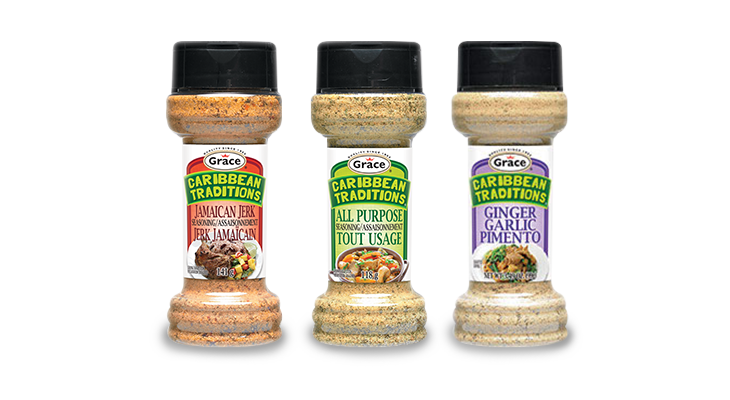 Capturing the passion and authenticity of traditional Caribbean cuisine, Grace Spice Bottles work well on meats, poultry, fish, vegetables, you name it! Use for making your dips, stir-fries, marinades and gravies too. 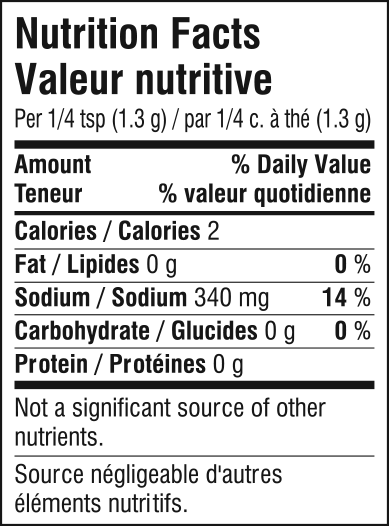 Salt, dehydrated vegetables (garlic, onion, parsley), monosodium glutamate, herbs & spices, sugar, canola oil, citric acid, silicon dioxide (anticaking agent), tartrazine. Salt, sugar, spices, cornstarch, monosodium glutamate, dextrose, wheat semolina, dehydrated vegetables (onion, garlic), canola oil, citric acid, silicon dioxide (anticaking agent). Salt, sugar, monosodium glutamate, wheat semolina, cornstarch, natural flavour (hydrolyzed soy, corn & wheat protein, yeast extract, chicken fat, chicken broth, whey solids, modified butter oil, dehydrated butter, partially hydrogenated soybean oil, thiamine hydrochloride), canola oil, silicon dioxide (anticaking agent), herbs & spices, paprika, dehydrated vegetables (onion, garlic, celery, parsley), citric acid, dextrose monohydrate, fd&c yellow #5 lake, spice extractives. 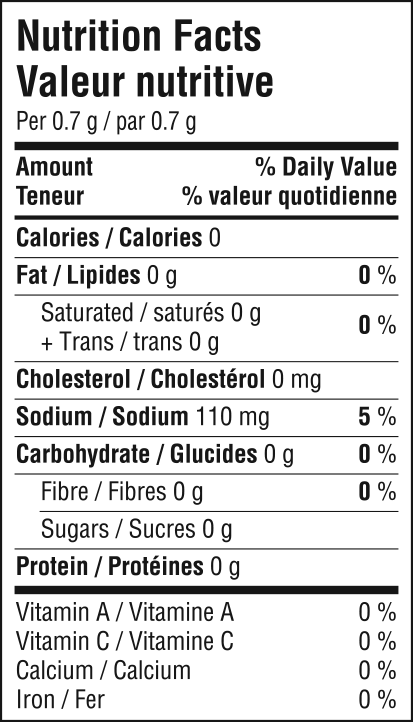 Contains wheat, soybean and milk. Salt, sugar, dehydrated vegetables (garlic, oinon), hgerbs and spices, raw sugar, canola oil, silicon dioxide (anticaking agent), caramel colour.